These plans are available as digital PDF files or AutoCAD files and are offered by Dr. Owen Geiger as complete and ready to build from. They are generic, conceptual plans that do not show the use of specific materials. They include necessary elevations, floorplans, cross section details, and other significant construction details; they don’t show every view, every detail — just enough to build. They do not include electrical and plumbing details. The plans are scaled and dimensioned. 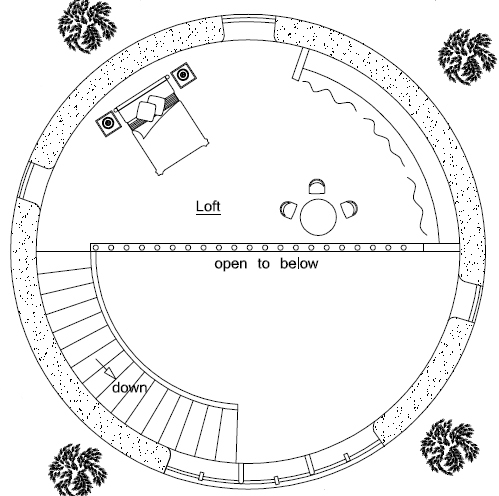 I have watched some of the round houses you design. 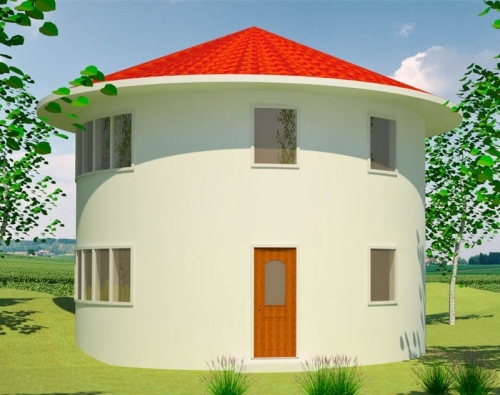 I therefore would like to request for a two (2)storey round house with a double volume living room and a stair case annexed externally above the main entrance foyer. Zambia southern Africa. Custom plans are no longer available unless you hire your own designer. Please could you tell me what product is recommended/listed in the above purchase plans for covering the roof? Metal roofing is almost always the fastest, easiest, most affordable option. Since it’ a roundhouse, it would be easiest to use flat (non interlocking) metal shingles. Hello sir owen can i ask how much is the estimated price for this house with aloft and waht book can i use to know the connections between the roof and the beams, wndows and doors etc?? The plans show the main building information. The plans are for international use so the details will vary from location to location according to local codes, wind speeds, available resources, etc. I’m eventually going to buy land in the country in Mexico where I’ve lived for almost 15 years and I’m very interested in something affordable that I can do myself (except for plumbing and electric) I am curious how I can make a design strong to resist earthquakes since we usually get 1 or 2 7.x magnitude quakes every year. I’d also like to know how to have a second foor on an earth bag house. I’d like to have a house with a 2nd floor room to protect the stairs and use like a greenhouse for winter vegetables and have an outdoor seating & plant area with some shade to look out over the landscape. Follow the link on the right hand side of the page to Earthbag Structures.com. That’s our site for building in disaster prone areas and developing countries. One story structures are safer than two story structures in earthquake regions. You might want to build with confined earthbags. Kelly did a project this way in Mexico. There are also other blog posts on the subject. Search this site for the term confined earthbags. Another option is to create a lightweight shade structure on the roof using curved steel pipe and chain link. There’s also a blog post on this building method that was featured in the $300 house design contest. I love to look at your house plans, first off. It keeps me sane during study breaks:) But anyway, I have a question or two. Could I make the center beam out of recycled brick and make it into a masonry stove? Second, (I don’t know if you have experience with this stuff) can solar film be used on a round roof? I’d like to heat our hot water and possibly have a radiant heat floor using this. Solar films are for generating electricity like photovoltaic panels. You’d need a solar water heater for heating water. You could have both on the roof. 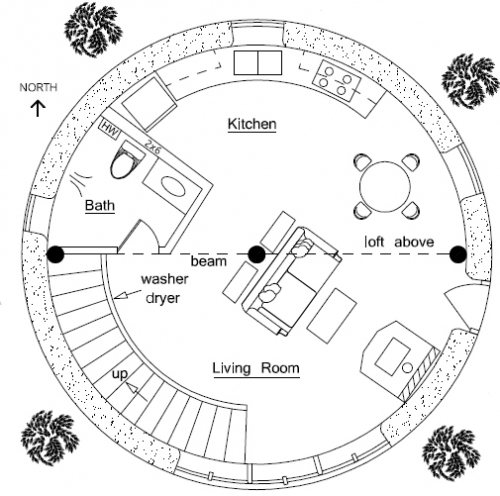 How hard would it be to add smaller domes onto this plan to accomodate a larger family? Not all plans are listed, but you can order every plan just by asking. I was wondering if it was possible to build a round earthbag home but putting a second floor in to make four bedrooms. We would want the kitchen to be in the center maybe with a staircase to help support the second floor. There are seven of us and we want to make it small but comfortable for all of us. Any suggestions? You could go earthbag or straw bale. Straw bales are faster, but more prone to moisture damage. Building below grade or into a slope will add cost and complexity, and increase risk of moisture damage. Build on high ground. I have checked on building codes already. I was originally planning on using cob but found that because it is “in town” even thou its now a ghost town, there are water, sewer lines under the property that i have to consider. Which of course i still to do an extent. I am assuming you are suggesting the square building as opposed to the round because it can be larger. I was really hoping for round. I was wanting something different. I was planning on eventually making three more. Maybe even renting one of them out eventually. It’s so simple that all you really need is a sketch if there are no codes. Keep in mind how people have housed themselves for thousands of years without building codes, architects, etc. Just keep it simple and you’ll be fine. We have free instructions such as YouTube videos that show every step. I need cheapest, which of your plans would be the cheapest to make with the ability to add on.I plan on tile floors and south windows lots of natural light none to the north. I need bathroom , kitchen and a living room at least big enough for three people to sleep in. I recommend something like the Economizer. It’s one of my free plans. The Economizer is small, simple to build and can be expanded in every direction. Make sure you’re building in an area with few or no codes or the cost will skyrocket. Code requirements can raise the cost 10-fold. I’ve written about building codes in many different blog posts. Is this possible with an earth-bag dome roof? I am trying to figure out the ultimate simple roof to make. Its just me and my two daughters no help and very poor. We were blessed with getting a dirt cheap property in a ghost town. Trying to make a home. Thanks for any help. This plan looks the most doable for us thus far. The absolute easiest roof is usually factory made trusses, purlins, metal roofing. The roof is actually multi-faceted, not curved so the metal sits flat. Then make the ceiling with sheetrock, wood, etc. and then add insulation. Hire some carpenters for this step if you have to. You don’t need high dollar contractors. Every carpenter knows how to do this. It goes very fast. Trusses in one day. Purlins in one day. Metal roofing in two days. They will have all the tools, ladders, etc. to make the job much easier. 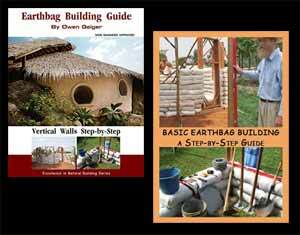 One story earthbag houses are far easier than lifting heavy soil high in the air. Start as small as possible because earthbag is labor intensive.